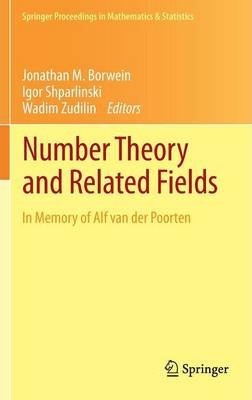 "Number Theory and Related Fields" collects contributions based on the proceedings of the "International Number Theory Conference in Memory of Alf van der Poorten," hosted by CARMA and held March 12-16th 2012 at the University of Newcastle, Australia. The purpose of the conference was to promote number theory research in Australia while commemorating the legacy of Alf van der Poorten, who had written over 170 papers on the topic of number theory and collaborated with dozens of researchers. The research articles and surveys presented in this book were written by some of the most distinguished mathematicians in the field of number theory, and articles will include related topics that focus on the various research interests of Dr. van der Poorten. Illustrations note 9 Tables, black and white; X, 395 p.
Number Theory and Related Fields collects contributions based on the proceedings of the "International Number Theory Conference in Memory of Alf van der Poorten," hosted by CARMA and held March 12-16, 2012, at the University of Newcastle, Australia. The purpose of the conference was to commemorate the research and influence of Alf van der Poorten in number theory and in general mathematics and presented an exciting venue for promoting number-theoretic research and graduate study in Australia. Comprehensive accounts of recent achievements in theoretical and computational number theory and its applications to cryptography and theoretical computer science were also paramount to the conference. The volume begins with a detailed academic appreciation of van der Poorten's life and work, and includes research articles written by some of the most distinguished mathematicians in the field of number theory. Contributions also include related topics that focus on the various research interests of van der Poorten, such as continued fractions and elliptic curves. Researchers in number theory and its applications will find this Proceedings of great interest. Preface.- Life and Mathematics of Alfred Jacobus van der Poorten (D. Hunt).- Ramanujan-Sato-Like Series (G. Almkvist, J. Guillera).- On the Sign of the Real Part of the Riemann Zeta Function (J. Arias de Reyna, R.P. Brent, J. van de Lune).- Additive Combinatorics with a View Toward Computer Science and Cryptography (K. Bibak).- Transcendence of Stammering Continued Fractions (Y. Bugeaud).- Algebraic Independence of Infinite Products and Their Derivatives (P. Bundschuh).- Small Representations by Indefinite Ternary Quadratic Forms (J.B. Friedlander, H. Iwaniec).- Congruences for Andrews' SPT-Function Modulo 32760 and Extension of Atkin's Hecke-Type Partition Congruences (F.G. Garvan).- Continued Fractions and Dedekind Sums for Function Fields (Y. Hamahata).- Burgess's Bounds for Character Sums (D.R. Heath-Brown).-Structured Hadamard Conjecture (I.S. Kotsireas).- Families of Cubic Thue Equations with Effective Bounds for the Solutions (C. Levesque, M. Waldschmidt).- Consequences of a Factorization Theorem for Generalized Exponential Polynomials with Infinitely Many Integer Zeros (V. Laohakosol, O. Phuksuwan).- On Balanced Subgroups of the Multiplicative Group (C. Pomerance, D. Ulmer).- Some Extensions of the Lucas Functions (E.L. Roettger, H.C. Williams, R.K. Guy).- The Impact of Number Theory and Computer-Aided Mathematics on Solving the Hadamard Matrix Conjecture (J. Seberry).- Description of Generalized Continued Fractions by Finite Automata (J. Shallit).- Some Notes on Weighted Sum Formulae for Double Zeta Values (J. Wan).- Period(d)ness of L-Values (W. Zudilin). Jonathan M. Borwein, FRSC is Canada Research Chair in Collaborative Technology at Dalhousie University. He received his Doctorate from Oxford in 1974 and has been on faculty at Waterloo, Carnegie Mellon and Simon Fraser Universities. He has published extensively in optimization, analysis and computational mathematics and has received various prizes both for research and for exposition.